Cook pasta according to directions, drain and cool. 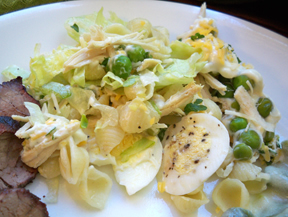 Combine mayonnaise, salad dressing, lemon juice, mustard and salt and pepper; mixing well until blended; add to pasta. 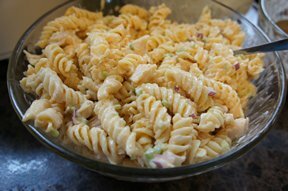 Add chicken and remaining ingredients; chill at least 2 hours. 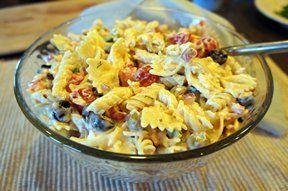 "Terrific pasta salad that is easily doubled or tripled for a crowd. I brough this to a benefit supper for my niece. Everyone wanted the recipe."